In the rapidly growing and highly competitive world of today; high-rise buildings, large apartments serving commercial and residential, and construction buildings have become hallmarks of urban development. This development usually comes with a significantly increased challenge in removing solid waste, refuse or garbage from high-rise buildings with multiple levels. 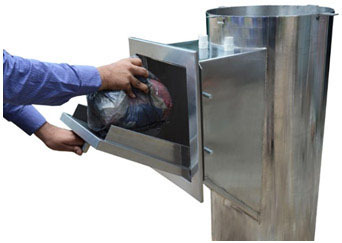 Central Chutes, a manufacturer, have therefore been developed as effective solutions to the problems of garbage collection and disposal for multiple-leveled high-rise buildings for residential and commercial apartments, with the in-built advantages of convenience, efficiency, safety and hygiene. Central Chutesare developed and installed in line with specifications provided in BS 1703:2005,NFPA 82, IS 6924:2001 and NBC 2005. Central Chutes are designed for a weather-proof service life with stainless steel. Central Chutesare designed with a sanitation system for automated internal cleaning. This automatic cleaning for our garbage trash chutes are implemented from the garbage room through a control panel. Central Chutes are also designed to permit disinfectant spray during internal cleaning. Central Chutes are designed with an exhaust system to provide alower limit of 20air exhausts every hour. For more information visit the website www.centralchutes.com, or fill the form below for us to contact you back.